Like to look at statistics but get bogged down by the numbers or can’t understand the charts, well have I found a treat for you. 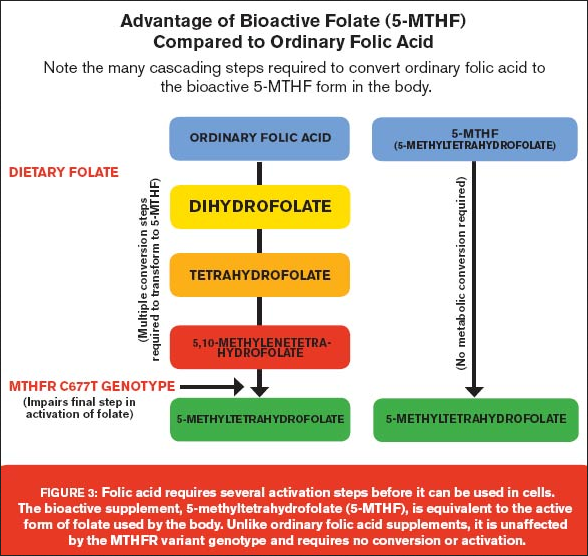 Look at the pictures and grasp the idea in a glance. These interactive graphs make understanding so much easier. 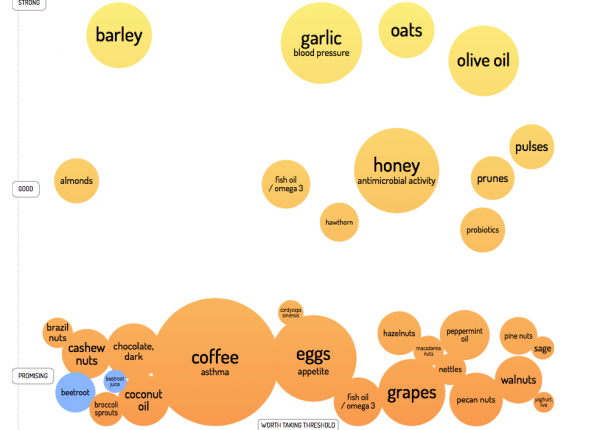 For the interactive version of this visual look at foods see more at informationisbeautiful. 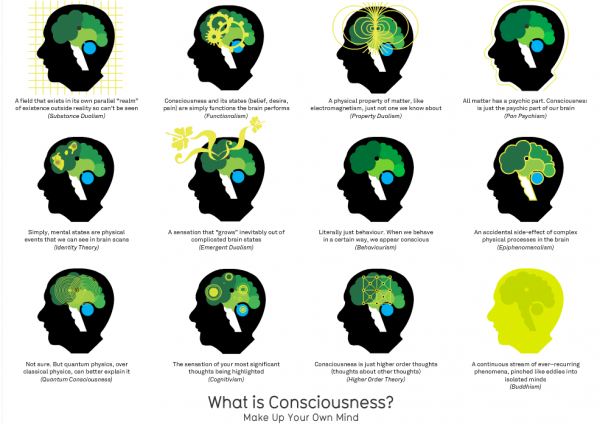 For the interactive experience of consciousness see more at informationisbeautiful. 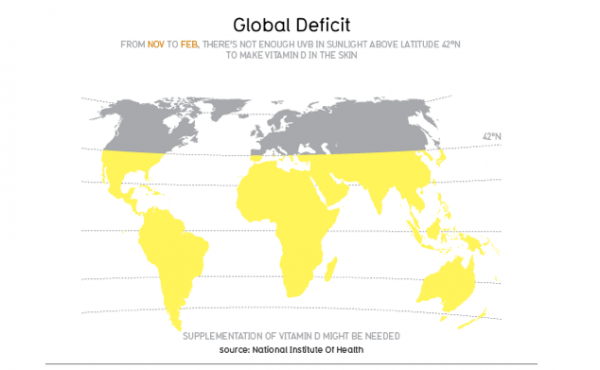 Vitamin D this time for a map of the world and how much sun we need. Written from a Northern Hemisphere perspective. To read more see here. Sirga, the lioness, is so excited to see Valentin Gruener. A loving hug. Just gorgeous. He raised her since she was a cub. True joy. Find out more of the conservation work being done at Modisa Wildlife Project. Brings back memories of watching Born Free. Listening to this song makes my heart sing. It makes me feel light and I am so in awe of the talent and the dignity of the artists. The theme of the song is a heavy one but it handled with so much care, Ebola the invisible enemy. To spread awareness about Ebola in song is the perfect medium to educate people and encourage people to visit a doctor. I was in the car, it was a Sunday afternoon. We were driving to a marina to look at boats. It was a blustery day with pockets of rain. We were on the motorway and I was just saying how much better I was feeling. I had been down for several days. Meanwhile the road construction was beginning to annoy me. When the line markers have been removed and the indentation is left and the sound of the tyre going over it, mile after mile…. The noise grated on me. I was either driving along the indents or too close to the new lane markers. It felt all wrong. The confining construction walls didn’t help. It made it feel like the lanes were narrower. So I was just saying how much better I was feeling then within about ten minutes I was feeling a full on panic attack while driving. I haven’t really felt one before, definitely not while driving. How did it go? I felt like it was hard to breathe. So I tried to breathe deeply. It wasn’t helping. I really wanted to get off the motorway. I wanted to cry. I wanted to not be there. Trying to calm myself didn’t seem to work. My mouth went dry. I kept smacking my lips together trying to get moisture. I kept trying to deep breathe. I sighed a lot. Meanwhile hubby was sitting next to me. Silently trying to work out why on earth I could suddenly be feeling so distressed after moments earlier saying how good I was feeling. Is it weather? Pockets of barometric pressure dipping? Is it low blood sugar? Is it hormones? I don’t know. I had three lows yesterday and during them they weren’t pleasant at all. I could recognise that they were lows. So what part of me says. How helpful is that? Is recognising how you are feeling helpful? I suppose it is. Is being able to describe how you are feeling helpful? I suppose so. How? I’m not sure yet. My hubby drove the next leg of the trip. I felt better with him behind the wheel. I’m sure he felt the same. This was me last month in a moment. An anxiety moment. How is it that when you are in an anxious moment you can feel the world crushing you but in fact it is just your perceived idea of reality? A warped one at that. Perception is everything. When someone tells you that your anxiety is not that bad or your depression is not that bad, it’s just mild. When you are in the middle of it, it doesn’t feel too mild. It irks me when I hear this. It doesn’t help me at all. From the light at the end of the tunnel it might not have seemed so bad after all but in the middle of the tunnel it is dark, forbidding and with no end in sight. Today I feel like I’m standing in bright sunlight. Eyes closed face to the sun. My head feels clear. The clouds have departed. I have clarity of mind. It’s a wonderful feeling. We were on a road trip camper van-ning for the first time and we were watching the price of petrol as we travelled up the country. There was a price difference of 18 cents per litre. This was without factoring in the supermarket discount coupons. (Buy x amount of groceries at a certain supermarket and they will give you from between 4- 40 cents off per litre at a participating petrol station. ) There was also talk in the newspaper of charging a $2 road toll charge for driving on Auckland motorways to increase revenue so that they could improve the infrastructure. Yes, we have motorways but they are all free apart from the one road toll north of Auckland and I think that is it for the entire country. The road conditions are pretty good considering the small budget that the country has to contend with. We enjoyed the break away from the everyday. 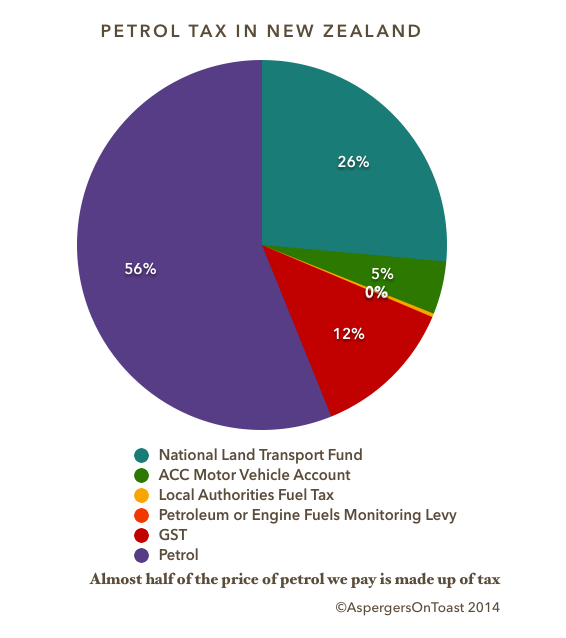 I got curious as to how much tax we were paying for the petrol we were buying. This is what I found out. See the pie chart below for details.